SkypesosMiles are derided by many to be the worst points/miles currency. No international first class redemptions. Horrible online pricing engine. Clueless agents. 3-tier award structure which means 325,000 miles for a transpacific/transatlantic redemption because it’s extremely difficult to find low seats. I’ve never been really interested in SkyMiles for those reasons, except that my award booking service had several requests for me to book redemptions for skymiles. I’ve been tinkering around and there are definitely certain ways you can extract amazing value from Skymiles. For 145,000 miles, I can get two separate round-trips, one with Virgin Atlantic from Vancouver to Johannesburg with all segments in Virgin Atlantic Upper Class, and a chance to experience the Clubhouse at London Heathrow which is considered one of the best business class lounges. The second part of my trip is on Virgin Australia Business Class, with a direct flight from SYD-LAX, which is one of the more difficult awards with American or United miles without routing via Asia. The award space is generally much stronger than with United or American miles (on the direct Oceania-North America flights) without fuel surcharges as well, which is something to keep in mind with non-US currencies such as Aeroplan. So both pieces of the award are probably the maximum value and cheaper/better than any other alternative mileage currency, considering that it is relatively easy to earn Skymiles. I did this last night, I’m actually very surprised and pleased that it would price. I’m leveraging several “sweet spots” of the Delta’s award rules. First of all I am using the better carriers ([un? 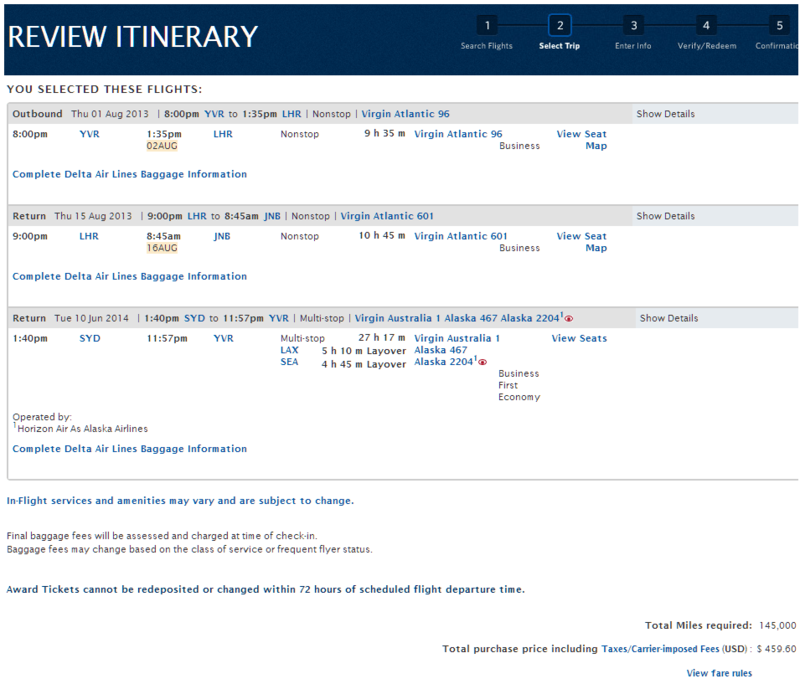 ]surprisingly non-Skyteam) Delta partners, but I am also using open jaws to my advantage. Remember with Delta, you are allowed open-jaws which means that each award is the additive amount of the two one-ways. 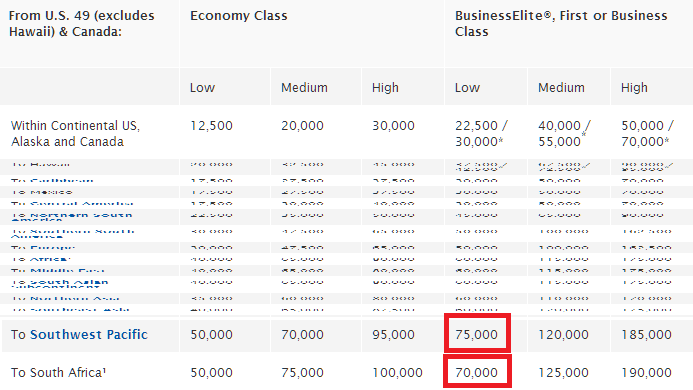 That means breaking down a round-trip award to Europe in business class is 50k + 50k = 100k for the actual trip. The engine is using a similar mechanism here, where North America to South Africa is 70k in business class, and South Pacific (Australia/Oceania) to North America is 75k in business class. This adds up to the 145,000 miles which the online engine prices correctly. I probably could have stuck a few more segments such as some intra-Europe segments to further reduce the taxes, although with each segment that you add that means it more and more likely that the engine will time-out. Note that the open jaw is from Johannesburg to Sydney which is 6863 miles. This is the shortest segment of the three legs which is why this makes it a valid itinerary. I am flying Vancouver to Johannesburg (via London Heathrow), and Sydney to Vancouver (via Los Angeles) on this award. Furthermore, I’m taking advantage of the zero YQ charged (note that out of the $455 taxes around ~$260 is the LHR Air Passenger Duty and ~$150 is other airport taxes/fees) on both Virgin Atlantic and Virgin Australia. If you space out the segments long enough, that means you can “get two separate one-ways” just like with American or United miles, if you space the award far apart enough as you can see in my award. I do plan to use each of these one-ways on separate trips. 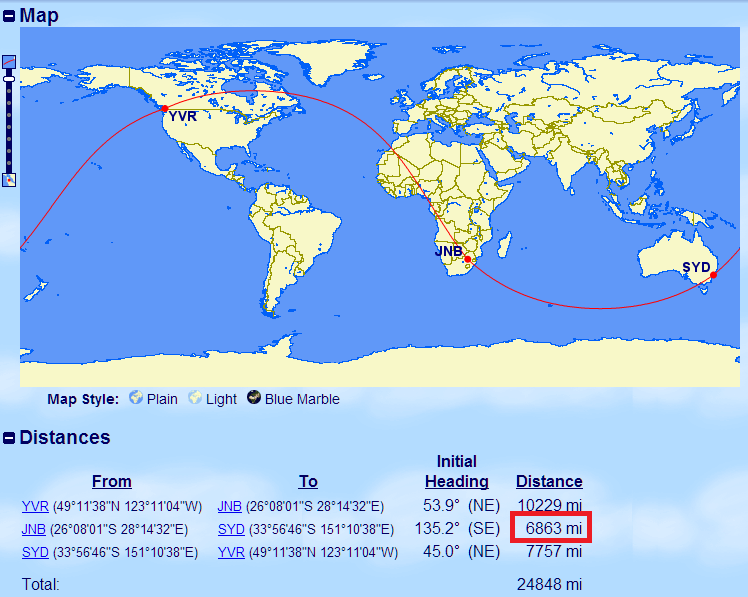 I’d probably do YVR-HKG-JNB in CX F for one trip and QF F YVR-LAX-SYD for the other. So that basically these are the types of awards that I like to play around when I have time. 🙂 If you liked this post, considering following me on Twitter as I do release important info and hint at other secrets. Whenever I find awards like this then you will see these types of posts! These posts are generally pretty brief and not for beginners as I am throwing a lot of concepts into one super-maximized award. If you have any questions about how I got this booking, feel free to comment below! What are doing/suggesting to get from JNB-SYD? I would be doing two separate trips, but you could connect JNB-SYD with any currency that allows one-ways such as Avios or United or American. From your screenshot (and the UK APD) it looks like you have a stopover in LHR, it’s not mentioned specifically. That stopover makes the award a lot more interesting! I was going to ask what you’re filling the OJ with, but it looks like you’re using it as a separate OW, judging by the dates. Yes, that was what I was going for so I could have “two trips” from this one award with one-ways each. @Tom I think the best is QF for 45K in J. So how will you get back to your origin with these trips? As I just updated in my post, JNB-HKG-YVR with Alaska on CX F, and then SYD-LAX-JFK-YVR with AA/Avios on QF F and CX J. There can be a lot of value in SM, despite its oft-deserved complaints. It just takes more effort than other programs.